Right-Radiant® is an easy-to-use program which combines industry standard ASHRAE calculation methods and field proven design techniques to provide a comprehensive radiant design and calculation tool, used to lay-out, size, and calculate in-floor radiant heating systems. View overview video. In conjunction with Right-Draw®, Right-Radiant® is a comprehensive CAD-Quality radiant design and calculation tool. It contains the complete ASHRAE list of floor covering R-values and supports variable covering of loops. With our exclusive Hotlink™ technology, Right-Radiant® will adapt the radiant design drawing instantly as you enter or change the parameters. Drag-and-drop radiant panels to your rooms in Right-Draw®. Interactive in its design, once you drag a radiant panel into a room, select a layout, and connect it to a manifold, Right-Radiant® will layout the pex in a variety of patterns (1,2 and 3-way serpentine, perimeter, outside wall tightly spaced with serpentine, counter-flow spiral, et cetera). It will also slow switchbacks in the layout for equal lengths, calculate flow rate, head pressure, loop length, surface temperature, delta-t, and back-loss, as well as calculate output and tells you where supplemental heat may be needed. Automatically design and layout radiant loops with a single mouse click. Right-Radiant® relies on industry standard conventions for spacing, manifold connections, your load calculation and bill of materials to create your loop design instantly for you. Calculate flow rates, loop lengths, loop layouts, and head pressures, even where supplemental heat is required. Each panel and loop is also customizable to suit any specific project parameters. Design snow and ice-melt radiant designs. Developed in partnership with a consortium of radiant panel manufacturers, Right-Radiant® offers more than just indoor heating capabilities, including sidewalks, driveways and more. Estimate costs through "Quick Quote" within Right-Radiant® without drawing a floor plan. The Quick Quote mode was designed for a first pass assessment, a design-free way to estimate a project, complete with a bill of materials. View a sample Right-Radiant® report. Create an instant bill of materials. Use Right-Radiant® in conjunction with Right-Proposal® to create a parts takeoff. Store preferences for future jobs. Right-Radiant®, like most other Right-Suite™ Universal products, has the ability to save common properties within the preferences library to use for future projects. Write the radiant layout to a CAD file. You may use this feature if you imported a CAD file first. Connected calculations offer greater accuracy and time-saving benefits for the designer. In fact, they never have to leave the actual program with all the calculations linked to the drawing, data never has to be extracted to alter. Easy to use module integrates with other Right-Suite® Universal modules. 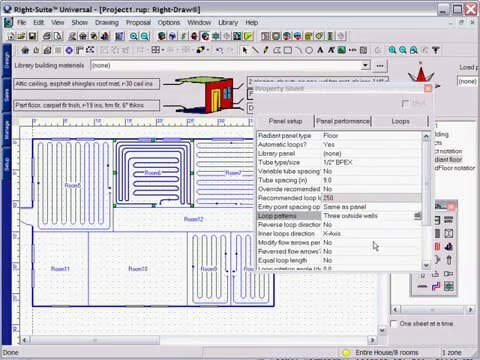 Generate an exact piping layout diagram from manifold to loops, complete with an accurate bill of materials. Simply add panels and connect manifolds, all other calculations are based on preset preferences and the load calculation from your floorplan. Calculates flow rates, loop lengths, loop layouts, and head pressures, even where supplemental heat is required. Customizable parameters for each panel and loop. Any modification to the preferences simultaneously updates the drawing itself via the Hotlink Technology™ These instant adjustments allow the contractor to play the "what if?" game, and quickly adapt to changes based on customer preferences. Save common properties within your preference library for future jobs. Estimate costs through "Quick Quote" without drawing a floor plan. The Quick Quote mode was designed for a first pass assessment, a design-free way to estimate a project, complete with a bill of materials. Trusted by leading manufacturers including Uponor (Wirsbo), Roth and Zurn. Eliminate the need for additional radiant drawing products, save time and improve layout quality with this all-in-one program. Connected calculations from loads to material types guarantees greater accuracy and allows the designer to play the "what if?" game, and quickly adapt to changes based on customer preferences. Right-Radiant™ is an easy-to-use and complete radiant design program with snow melt capabilities developed in partnership with a consortium of radiant panel manufacturers. Right-Draw® and either Right-J®, Right-F280™, Right-CommLoad™, or Right-N®. A permanent license allows you to use the software indefinitely. For the first year, you are entitled to software updates and technical support. After the one-year period ends, you must purchase Wrightsoft Software and Support (WSS) each year for continued software updates and technical support. An annual license allowing you to use software, download updates, and receive technical support for one single year. After the one-year period ends, the software will no longer function until a new license is purchased.